Judo 2010 Tblisi: Shalva Kardava (GEO) - Bradford Bolen (USA) [-66kg]. Shalva Kardava (GEO) - Bradford Bolen (USA) [-66kg]. 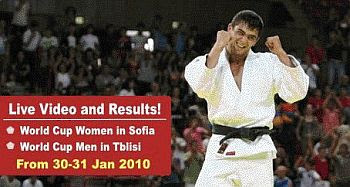 Judo 2010 World Cup Men Tblisi (GEO). 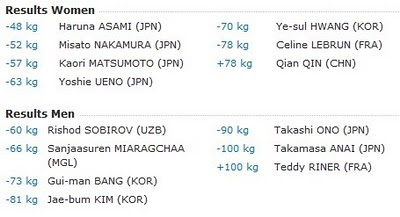 The International Judo Federation Technical Committee meeting held in Tokyo in the last days of December 2009 decided that starting in 2010, two athletes per weight category are allowed to represent a nation. The suggestion was made by the IJF President, Mr. Marius Vizer. The decision is valid for World Championships Senior, Junior and Cadets. “We noticed that many good athletes had to stay at home. There were full generations not allowed to compete in the World Championhips. Take alone the case of -48kg in Japan, with Rioko Tani reigning for such a long time and also what can happen to the heavy weights in France with Tedy Rinner supremacy”, says IJF Head Sports Director Mr. Vladimir Barta. Mr. Barta also gave examples of top athletes struggling inside their countries to qualify like the case of Alexander Mikhailin and Tamerlan Tmenov, in Russia. The IJF launches a new video site with examples on video of the new rules 2010.